Powers/Abilities: Nox has unspecified powers relating to darkness. Unlike many of the other Fear Lords, she does not actually feed on fear, nor does she require it to survive. She apparently cannot actually generate fear in and of itself. However, she does derive great aesthetic pleasure from stimulating fear in others, especially mortals (whom she refers to as the helpless ones). Nox can generate darkness, and can create solid objects out of darkness (this may be some aspect of the Darkforce, into which she taps). She can form the powerful ensaring Tendrils of Night to physically bind others, or to "strangle their souls." She can create the Sword of Night which can steal souls even as it slays. In addition, she can open dimensional portals and can call on a number of mystic entities for magical power. She has a weakness to light, especially to that of the all-seeing Eye of Agamotto. History: (Greek Myth) - Nox is one of the most ancient of the Olympian Gods having been born before the Hyborian Age. She was said as being born out of Chaos and the wife of Erebus, the god of day, however, later myths later claimed she was born from the Titan Ophion and the ocean-goddess Eurynome. She and Erebus gave birth to the abstract gods of the Greeks such as Hypnos, the god of sleep, Keres, the god of punishment, Momus, the god of ridicule, Charon the ferryman-god and the first Eros, mentor to Cupid, the son of Aphrodite. She was also rumored as being the grandmother of Gaea, Mother Earth, through Aether and Hemera, but this is obviously erroneous. (Doctor Strange: Sorcerer Supreme#32/2 (fb) ) - Posing as the Greek love goddess Aphrodite/Venus, Nox made love to the war god Ares/Mars. This revolted her, but achieved her purpose: From this union she bore two sons, Deimos and Phobos (Fear and Terror). (Mystery Men#4 (fb) - BTS) - At some point Nox made love to Cerberus. The result of their union was a litter of hounds. 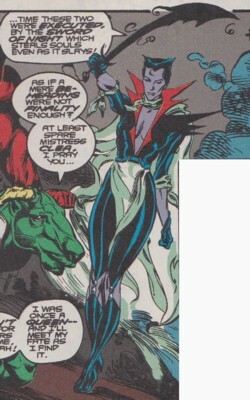 (Mystery Men#1 (fb) - BTS) - At some point Nox lost her physical form. (Mystery Men#1 - BTS) <1930s> - General Piper formed an alliance with the Fear Lord Nox. He worked heavily on restoring Nox to her physical form while she gave him a charm that made women fall for the General because he made them see him the way he wanted them to see him and not his true heavily scarred body. Nox also aided the General in acquiring an amulet once worn by the hero Achilles. (Mystery Men#1 - BTS) <1932> - General Piper sacrificed Broadway actress Alice Starr in a mystic circle to enable Nox to regain her physical form, but the sacrifice was not enough to restore her. Nox possessed a girl the General was visiting for pleasure. She apologized for the bad timing and revealed that even though the sacrifice of Alice Starr was not enough to restore her it gave her enough strength to put Achilles' amulet in the way of the General's employee, archeologist Lewis Green, in Troy. She then revealed that it needed a sacrifice that wounded the entire nation to restore her physical form. While she talked the possessed girl's body decayed until nothing but a pool of blood was left on the ground. (Mystery Men#3) - Though it pained her Nox took possession of a bellboy at Empire State Building, who was attacked by the General for disturbing him. Nox promised the General that she would be able to help him regain Achilles' amulet from Lewis Green, but only after she had regained her true form. Nox asked the General if he was ready to abandon all vestiges of morality and humanity and the General replied that he was only waiting for her to ask. The General had the 167 residents of Dark Willow, West Virginia massacred. The sacrifice was enough to restore Nox to her true physical form. Nox thanked the General for restoring her and complimented him on his latest work, abducting children for a sacrifice on summer solstice to restore Nox's full power. Nox gave the General a bracelet that would give him the power to fight the wearer of Achilles' amulet and the other Mystery Men. She was sure the General would defeat them before the summer solstice sacrifice and that they would come looking for him after his next move that would bring the nation to its knees. (Mystery Men#4 (fb) - BTS) - Nox relished in the pleasures of having a physical form again with the General as her lover. (Mystery Men#4 - BTS) - The General kidnapped the son of Charles Lindbergh as another child for the summer solstice sacrifice. The kidnapping lured the Mystery Men to him. (Mystery Men#4) - <May, 1932> The General got tired of Nox ordering him around like a butler, but she told him that it was actually a great honor for him to serve her. Revealing that the Mystery Men were coming like they had planned she promised the General he would regain the amulet of Achilles soon. Nox then ordered the General to use the bracelet she had given to him. The bracelet transformed the General into a werewolf Nox called Lysseus. She then led him to his new allies, her children with the hound Cerberus, whose passion she compared to the General's. She promised her children would destroy their enemies alongside the General. During the General's battle against the Mystery Men Nox released her children on them and threatened that her children would feast of their livers and lick the Mystery Men's bones clean. Achilles (Professor Lewis) fought Nox's children, but got taken down quickly by them. They held him down for the General, but Achilles used his amulet's power reserves to free himself from the jaws of Nox's children and escape them and the General. After the battle Nox and the General moved the kidnapped children to another hideout with the Board's blimp. The General was surprised he couldn't remove the bracelet anymore, but Nox told him that all was like it should be. (Mystery Men#4 - BTS) - Nox used her illusory powers to make people believe that a puppet found days after the Mystery Men had failed to save the children was the dead Lindbergh baby. The puppet was buried in place of the Lindbergh baby. (Mystery Men#4) - Two grave robbers discovered that it was actually a puppet in the Lindbergh son's casket. Nox slew them before they could tamper with the arrangement, which would have made her illusion fade. The big summer solstice sacrifice was still one month away and Nox believed it was better if the public believes the child was already dead. The General told Nox that he still needed Achilles' amulet, but Nox ignored him and repeated that the great sacrifice was one month away. Like a good pet he then buried the dead grave robbers for Nox. (Mystery Men#5 (fb) - BTS) - Nox invited Baron Zemo to a meeting with the Board. (Mystery Men#5) - On their way to the Board's blimp Nox promised Zemo that the General would convince the Board to ally with Zemo's friends in Germany. She calmly watched as the General sacrificed a critical member of the Board in a mystic circle to bath the other Board members in a fraction of the power he promised them through the summer solstice sacrifice of the children. <Summer Solstice 1932> Nox and the General boarded the Board's blimp with the children. During their flight the Mystery Men attacked the blimp. Nox ordered the General to take out the Revenant, who offended her sensibilities (she was kind of a racist). Surrounded by her children Nox watched the General being decapitated by the Operative, the General's son, with Achilles' sword. Picking up the General's lycanthropic head she commented that he had outlived his usefulness anyway and then ordered her children to slay the Mystery Men. While the other Mystery Men fought Nox's children Achilles attacked her by himself. Nox offered Achilles the chance to become her lover because she believed they were meant to be together, but Achilles, hoping he could destroy her, instead released all the life force stored within his amulet through a kiss, sacrificing his life in the process. Unable to cope with so much energy Nox was temporarily rendered unconscious. (Mystery Men#5 - BTS) - Nox regained her senses and escaped with Charles Lindbergh Jr. while the Mystery Men saved the other children. (Mystery Men#5) - Nox and Baron Zemo returned Charles Lindbergh Jr. to his family. Nox told Lindbergh that they had to keep his son's survival a secret and that her allies, like Baron Zemo, would protect Lindbergh and his family in the future. In return Lindbergh could support the new rising power in the east (Nazis). Lindbergh shook hands with Zemo and promised they could count on his support for what they had done for his family. Nox had a big smile on her face. (Doctor Strange: Sorcerer Supreme#32/2 (fb) ) - Nox traveled to the Microverse, aka Sub-Atomica, where she found a scientist on the world of Traan, and guided him in his efforts to unlock the enigma of fear. This man went on to become the Psycho-Man. (Doctor Strange: Sorcerer Supreme#32/2 (fb)/Man-Thing I#22(fb), 19-22-BTS) - Nox guided the demon Thog to obtain the Nightmare Boxes and use them in a plot to plunge the universe into madness. (Doctor Strange: Sorcerer Supreme#31/2-33/2) - Nox was summoned to the Halls of Fear, where she joined with several other Fear Lords in the planning of a plot to plunge Earth into terror, allowing them to take it over. (Doctor Strange: Sorcerer Supreme#38-39) - As part of this plot, Nox (alongside Kkallakku and the Fear-Eaters) attacked Dr. Strange and his allies, Clea and Rintrah. The increased levels of fear produced by previous efforts of the plot allowed her to reincarnate her two children, Deimos and Phobos. While Strange was occupied by the Fear-Eaters, Nox and her sons of the night abducted Clea and Rintrah to some pocket realm in which to slay them. 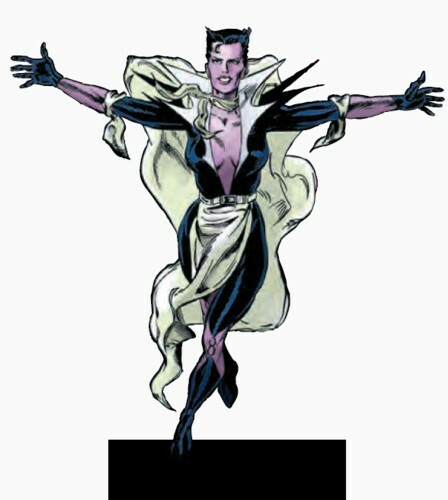 However, Strange managed to overcome his own attackers, and sent a burst of light into the pocket realm. This weakened Nox and her children long enough for Clea and Rintrah to free themselves, and for Strange to arrive himself. As Clea and Rintrah threw off the effects of fear, Deimos and Phobos melted away into nothingness. Nox attempted to call on an array of dark magical entities to enfold and slay the heroes in night's shadow, but Strange used the Eye of Agamotto's light to disrupt her spell. Nox recognized that Strange had found her weakness, and since she was not as intimately involved in the Fear Lords' plot, she chose to teleport away rather than risk capture or destruction. (Hercules: Fall of an Avenger#2) - Nyx arrived late at Hercules' funeral to oppose Athena's claim to the Olympian throne. She brought along Nightmare as her champion. Amadeus easily caught Nightmare in Bruce Banner's pocket teleporter. (Journey into Mystery I#633) - The Fear Lords met to discuss the Serpent's recent attacks on Earth. Nightmare was not present at the meeting as he planned to harvest the fear left behind by the Serpent for himself. (Journey into Mystery I#636) - Loki and Leah tricked the Fear Lords into a meeting to tell them about Nightmare's scheme to harvest fear the Serpent brought to Earth in a crown to become the King of Fear resulting in an endless battle over the crown between the Fear Lords in Nightmare's realm. (Journey into Mystery I#645 (fb) ) - Loki tipped of Mephisto to the predicament of the Fear Lords. Mephisto interfered and overpowered the Dweller-in-Darkness, the current holder, to take the crown for himself. He secured the Fear Lords' alliance and subservience by feedig them a ration of the fear collected by the crown. Mephisto hoped to gain enough power to fill Satan's empty throne eventually. (Journey into Mystery I#645) - Loki sacrificed his thoughts and dreams to destroy the crown as it had been created hy his mind in the first place. Without the crown the Fear Lords no longer served Mephisto and chased him away. Comments: Created by Roy Thomas, Dann Thomas, Jean-Marc Lofficier (writers), Larry Alexander (pencils) & Tony DeZuniga (inks). The connection of the Fear Lords to other entities, such as the Dark Man, the Asgardian manifestation of Fear, @ Thor I#323, is unknown. A big thanks to Will U, for supplying all of the relevent mythological data! Once again I admire a Greek god's passion for animals. Nox likes it Cerberus-style! Nox has an entry in Marvel Zombies: The Book of Angels, Demons & Other Monstrosities. Profile by Snood. Mystery Men update by Markus Raymond. 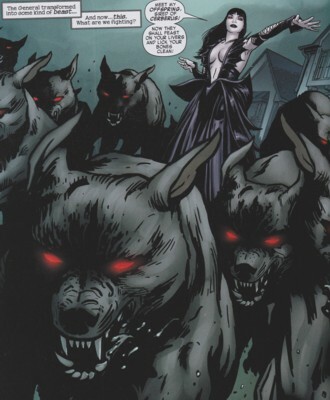 (Mystery Men#4 (fb) - BTS) - At some point in the past Cerberus sired a litter of hounds with Nox. (Mystery Men#4) - All grown up the powerful hounds served their mother in her plot to regain her full powers. (Mystery Men#4 - BTS) <May, 1932> - After the General, empowered by mystical bracelet, transformed into the werewolf Lysseus, Nox introduced him to her children, who would aid him in killing their enemies the Mystery Men. (Mystery Men#4) - Nox sent her children into battle with the Mystery Men when the General was overpowered by Achilles (Professor Lewis). The hounds jumped Achilles and held him down for the General, but Achilles used the power reserves of his amulet to free himself from the hounds' jaws and repulsed them with a powerful energy blast. (Mystery Men#5 - BTS) <Summer Solstice 1932> - The hounds boarded the Board's blimp alongside their mother, the General and the kidnapped children. (Mystery Men#5) - One of the hounds guarded the blimp's door when it was opened by the Operative. Aviatrix shot the hound with her new automatic weapons. The other hounds were at their mother's side when the Mystery Men attacked the blimp. After the Operative decapitated his father, the General, Nox sent her children against the Mystery Men. Surgeon, Operative and Revenant fought the hounds until Aviatrix boarded the blimp and shot them all dead like their sibling.